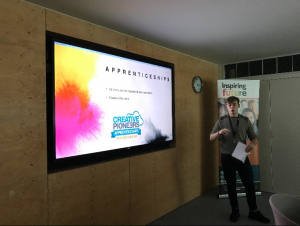 For National Apprenticeship Week, we teamed up with MullenLowe to run a thematic event with the Apprenticeship Support and Knowledge for Schools (ASK) programme. The aim of the event was to help students understand more about the world of advertising and apprenticeships in this sector. On Friday 8th March, MullenLowe, an advertising and marketing communications agency, opened their offices to students and teachers from eight different school and colleges across London. Three teachers and 19 sixth form students attended to find out more about advertising and learn about doing apprenticeships within the field. The event kicked off with a member of the ASK team giving a general but detailed overview of apprenticeships. The talk included giving information on what apprenticeships are, the different levels and how to find one. Then the MullenLowe representatives took over, discussing the company’s specific apprenticeship programmes and internships. They gave the audience an insight into what an apprenticeship in advertising looks like and the support they offer to apprentices. As the day progressed, the students and teachers had the opportunity to hear from numerous people from different roles within the company. Firstly, one of MullenLowe’s Creative Directors, who works in the digital department, addressed the audience and was followed by junior ad creators. Other speakers were apprentices from the finance, account management and media teams. During the lunch break, the audience members were given the amazing opportunity to network with MullenLowe employees, giving them a chance to learn more detail about becoming an apprentice and what they do. If you are interested in promoting apprenticeships in your school or college, you can find out more on Inspiring the Future or ASK by emailing apprenticeships@educationandemployers.org.